0735am Friday 30th March, originally uploaded by bobsee. What are you going to photograph? Whatever strikes you – whatever you notice. Where to look? Look up. What do you see? The sky, the clouds, the sun coming up, the brightness, hues and colours. In today’s British Medical Journal, GP, Dr Iona Heath writes about how while the government talks about patient choice and patient centred care, in fact it is increasingly delivering a standardised, rule and protocol driven one-size-fits-all service. She links this dehumanisation of the NHS to the power of the pharmaceutical industry. Only if doctors have the freedom to explore and explain options can patients be free to make their own decisions. Doctors who actively elicit the patient’s own values and priorities and support an informed decision based on awareness of both the possible harms and the potential benefits of a proposed treatment will reduce levels of pharmaceutical consumption. But, of course, this operates against the interests of the medical-industrial complex. If doctors are encouraged to offer standardised care, as they are under the quality and outcomes framework, pharmaceutical consumption rises and patient choices become constrained. This is a worrying trend. With the bureaucratic drive to “standardise” treatments, probably with the intention of attempting to control costs, patients are not encouraged to make individual informed choices about whether or not to start taking some form of medication. One of the consequences of this, Dr Heath argues, is that pharmaceutical consumption rises. Why is the NHS struggling financially despite record investment by the government? Partly because of rising drug costs. This zombie-form of health care is not sustainable and the solution to the problem? A hero-form of health care. Heroes make free choices. That’s how they grow and that’s how they increase their health. Encouraging individual diversity is not only healthy for people, it’s healthy for the health services too. Probably the main losers are the pharmaceutical companies whose sales may be hit by patients choosing non-drug solutions to their problems. A Matter of Life and Death was made in 1946. It’s a film by Powell and Pressburger. They tell the story of a pilot, Peter Carter, shot down during the Second World War. But as he falls to Earth, the angel sent to bring his soul to heaven loses him in the fog, and by the time they find him he has fallen in love so he pleads to be allowed to stay alive a while longer. A court case to decide the issue is set up in Heaven. OK, so far, you’re thinking “this is just crazy, isn’t it?” Well, it’s a much more interesting movie than just a fantasy. And here’s what makes it interesting for me – Peter’s new love, June, asks a doctor friend to see him. This doctor, Dr Frank Reeves, is a neurologist and diagnoses that the pilot is suffering from a brain lesion which is affecting his visual pathways and so causing these vivid hallucinations of angels, heaven and a court case. What Dr Reeves very cleverly realises is that Peter’s story of the court case in heaven is so coherent and convincing to him (Peter) that if the case goes against him he will die and if it goes in his favour he will live. He deliberately encourages Peter to develop a positive narrative of how the case may go while persuading a neurosurgical colleague to operate on Peter. The operation is successful and so, of course, is the court case. A weak mind isn’t strong enough to hurt itself. Stupidity has saved many a man from going mad. This is part of his argument that this “delusion” of Peter’s is not madness but is a physical problem of the brain. He argues that the delusion has its own internal logic and that Peter has an exceptionally good imagination. This is an interesting early exploration of the relationship between psychiatric illnesses and organic brain disease. But mostly it is an interesting exploration of the importance of the patient’s narrative, not only as a key method of diagnosis (a skill I fear is being lost in Medicine today) but also as a determining factor in healing, even in tipping the balance between life and death. More than this, it makes me think about the age belief – that there is a fine line between genius and madness. However, there is no known link between IQ (one measure of “strength” of mind) and the chances of having a mental illness. But is this what Frank means by “strong” or “weak”? What IS a “strong” mind? Frank says nothing about Peter’s intelligence, what he emphasises are Peter’s imagination and his ability to be logical. Here is what he really means – a “strong” mind has at least two strong capabilities – imagination and logic. Aren’t these key tools in the creation of narratives? Aren’t the most compelling narratives the ones which have been well imagined and seem to the reader to make sense (within their own terms)? So, what of this apparent danger in a “strong” mind? If we think of this the same way as Frank we can see that if the narrative we tell ourselves becomes dislocated from external reality but is a STRONG narrative then it becomes harmful. This is the way I understand psychosis – a psychotic state is one where the person’s beliefs, their narrative of self, is not well connected to external reality and so becomes a hindrance rather than a help in living. What’s the lesson here? It’s good to develop a strong narrative ability (it is this, at least partially, which saves Peter’s life – OK, I know, some will argue it’s the surgeon’s skill which does it, but time and time again recovery depends on individual patient’s mental state even when the same pathology is excised by the same surgeon). The danger lies in creating stories which don’t make sense of external reality when the storyteller fails to realise that. We can protect ourselves from that by sharing our narratives to co-create with others the narratives that make sense of all our lives. Phantoms in the Brain by Sandra Blakeslee and V.S. Ramachandran (ISBN 1-85702-895-3). Ramachandran is a specialist in brain research and I’ve both read some his previous writings and have often seen him referred to by other neuroscientists. His particular interest is in perception which he researches from a neurological perspective. The mechanisms of perception are much more complex than they seem. Take vision for instance. Many people have a vague idea that the way we see things is by light passing through the lenses of eyes, setting off some kind of impulses down the nerve fibres which connect to the backs of our eyes (the retina, which is made of of cells called rods and cones). These signals are then sent to brain, maybe you even know that they go to an area of the brain called the visual cortex. I guess many people who even know this much think of a kind of screen on the back of the brain where the images are projected, a bit like being at the cinema. It doesn’t take long however to figure out that this can’t be right. Who’s watching the screen? And how do “they” turn what they “see” into an image? No, it’s more complicated. In fact, creating an visual image involves some 30 distinct areas of the brain all working together! Ramachandran is great at explaining this kind of thing and in his book he covers not only vision, but all kinds of perception, discussing phantom limbs, memory, emotions and beliefs. He even has a chapter entitled “The Zombie in the Brain” about some of the automatic functions of the brain that go on below the level of conscious awareness. There’s not much new in this book. If you’ve read works by Antonio Damasio (Looking for Spinoza, Descartes’ Error and The Feeling of What Happens) and Oliver Sacks (The Man who Mistook his Wife for a Hat, An Anthropologist on Mars, Awakenings) you’ll be familiar with most of the issues explained here. However, if you’ve never read anything about perception and the brain before this would be an easy and informative place to start. So that’s what I liked best about this book. It is scientific, easy to read, and based on the real experiences of real people. Individual human beings are completely fascinating and their stories are frequently utterly amazing. Phantoms in the Brain is full of amazing stories and after reading it you’ll never think about perception the same way again. Petrol on water, originally uploaded by bobsee. A more conscious life is a more aware life. A great way to become more aware is to carry a digital camera – a small one – everywhere! It’s amazing what you’ll see when you know you have a camera with you. 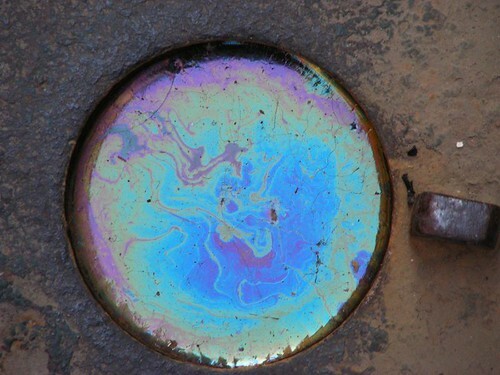 Look at the amazing colours and patterns of the oil on the water in this post hole in the road round the corner from the hotel where I stayed in Aix-en-Provence. The hotel was called “Aquabella” – beautiful water?